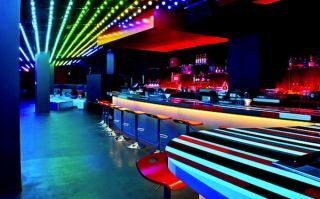 The recently opened, upscale, high-energy Tunnel Nightclub features a powerful QSC sound system, comprised of six AcousticPerformance AP-5122m high output 12-inch, two-way loudspeakers augmented by GP118-sw 18-inch subwoofers, all powered by the company’s new RMXa Series amplifiers. Pro audio, lighting and production company Fastlane Productions of Billerica, MA installed the QSC sound system and front-end DJ equipment at the subterranean venue. Designed by Sousa Design Architects, the Tunnel Nightclub is located beneath the W Hotel & Residences in the Theater District of Boston’s Back Bay/Midtown neighborhood. According to Mark Glunts, president of Fastlane Productions, the 200-capacity Tunnel is the brainchild of a long-time client, Brian Lesser, founder and president of Boston-based Speakeasy Group, which owns and operates numerous area nightclubs and restaurants. “I’ve probably installed a hundred AcousticDesign series QSC speakers in the Boston area over the last few years, but we needed something larger, something that was really going to give a high output performance. During a 2013 QSC factory tour I heard the new AP Series loudspeakers, and they sounded great,” stated Glunts, so he specified the AP’s for installation at Tunnel. “We’ve got the AcousticPerformance loudspeakers lined up all the way down one side of the club, hanging at an angle and facing across the room. The speakers right over the bar shoot past the bartenders but hit the floor just past the bar, so it’s a comfortable level for them,” Glunts reported. The loudspeakers are powered by one RMX 2450a and three RMX5050a’s. Glunts also installed a K Series K12, 12-inch two-way active loudspeaker for monitoring at the DJ booth, which is located midway down the room between the bar and a VIP lounge area.